In a revealing message from ISIS, women are instructed that beauty salons are condemned as the devil’s work and child marriage is encouraged in the recruitment document on jihadist forums. 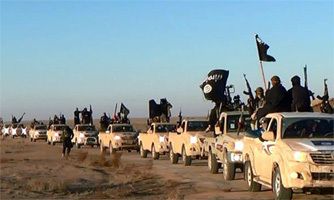 Women should “remain hidden and veiled”, only leaving their homes in exceptional circumstances, according to an Islamic State manifesto intended as a recruitment tool. 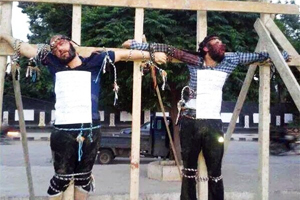 ISIS crucified two Syrian citizens accused of having spoken against ISIS. According to Sky News, the document includes a curriculum for teaching young girls how to be homemakers and mothers who are “sedentary, still and stable” – and condemns the notion of gender equality. It also criticizes the West’s obsession with studying “the brain cells of crows, grains of sand and fish arteries”, and suggests such educational pursuits are a distraction from worshiping God, which is “the only reason for their existence”. 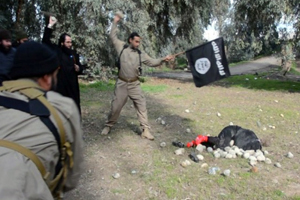 ISIS stones a woman to death for allegedly committing adultery. In another section, ISIS authors state: “Women gain nothing from the idea of their equality with men apart from thorns. Click here for the full report with video from Sky News. We have been lured into a poppy field where we have fallen fast asleep as grave danger quickly approaches. 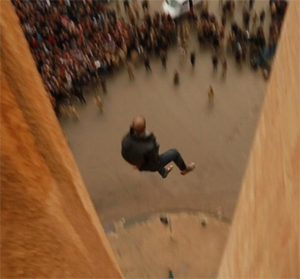 Warning the following video produced by ISIS contains graphic violence, death and evil. To know how evil, the burning begins at the 18:00 minute mark. This entry was posted in National on February 9, 2015 by admin.